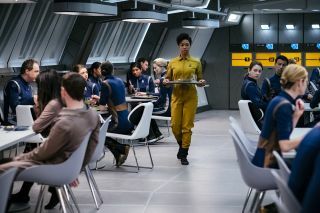 Michael Burnam (Sonequa Martin-Green) walks through the cafeteria after her prison transfer is interrupted by a trip to the USS Discovery in Episode 3 of "Star Trek: Discovery." Warning: This recap includes spoilers for Episode 3 of "Star Trek: Discovery." Last week's opener of "Star Trek: Discovery" was an action-packed wallop of Klingons, mutiny and explosions. Some Trekkies weren't happy with the double-header episode, complaining that it didn't really feel like "Star Trek." To those Trekkies, we're happy to say — welcome back. You'll like Episode 3 better, because it has several nods to Trek lore, from tribbles to technobabble. Enter the USS Discovery, which uses a tractor beam to get the prison transport aboard the starship. Almost immediately, Burnham gets in a fight with her fellow prisoners, earning a summons to the quarters of her new captain, Gabriel Lorca (Jason Isaacs). Lorca orders Burnham to take a temporary role on his ship because she has expertise in a form of physics that Lorca needs for his "mission." Burnham, who doesn't want the assignment, asks Lorca what that means. "To win the war, of course. To send everyone home safe and happy," Lorca responds. In typical Trek style, the situation quickly turns complex. Burnham is assigned to a science room that, strangely, has a highly restricted research area. Nobody will tell her what she's working on, especially her new officer in command, Lt. Stamets (Anthony Rapp). Burnham later breaks into the restricted part of the lab to discover beautiful plants growing, but that doesn't shed much light. And that's this week's cliffhanger, making us wonder what this tech is. Something related to warp speed? A gateway constructed by the Iconians, a race with advanced travel tech that was discussed in "The Next Generation" and "Deep Space Nine"? We don't know for sure yet, but we hope future episodes will make it clearer. It's fun to see science and the military finally come in conflict in a Trek series. Stamets has a beautiful monologue about how he was working on something really cool, but the military appropriated it and now he's stuck working for an organization he never wanted to join. More of this, please. It's clear Lorca has ulterior motives, but we don't really know his full deal yet. He makes it clear that he's not above operating beyond Starfleet protocol (one reason that Lorca respects Burnham's mutiny, he says). But there's more weird stuff to come, it seems. The last shot of the episode shows him in an office next to a cage containing the deadly creature on the USS Glenn — the creature was evidently beamed aboard his ship for reasons that aren't explained to the audience. Lorca also has a tribble on his desk in another scene, but beyond pleasing "Star Trek: The Original Series" fans we're not sure if there's a significance. Saru (Doug Jones) is really coming into his own after three episodes. He used to serve with Burnham before the mutiny, and has trouble trusting her: "I believe you feel regret, but in my mind, you are dangerous," he tells her. But it is Saru who recommends Burnham for the away party, even though everyone on the ship is giving her the stink eye for her mutiny. Every scene with him is worth watching, as he has little pretense and isn't afraid to say exactly what he thinks. In a minor "squee" moment for fans, it's confirmed this week that Sarek and Amanda — the parents of Spock — did raise Burnham as well, right alongside him. And it was Amanda that used to read "Alice's Adventures in Wonderland" to Burnham, which (we are told) taught Burnham that the universe is not fully logical. Eagle-eyed science-fiction fans probably immediately recognized Cmdr. Ellen Landry — she's Rekha Sharma, best known for being one of the human cylons on "Battlestar: Galactica" (2004-2009). I wonder if she'll throw anyone important out the airlock again.